I am totally obsessed with babies; I have been ever since I was a little girl. I was lucky enough to have grown up with older cousins who kept popping out kids one after the next. So from the time I was six years old, I was constantly around babies. I got to feed them and play with them and of course my favorite part….dress them. Honestly, if you can walk past the children's clothing department in any store and not make that high pitched squeeley “awwwwwww” noise, something is wrong with you. How in the world you can pass over a bright pink tutu dress with sequins and lace and all things SUPER girly and not want to have a baby that minute is beyond me. 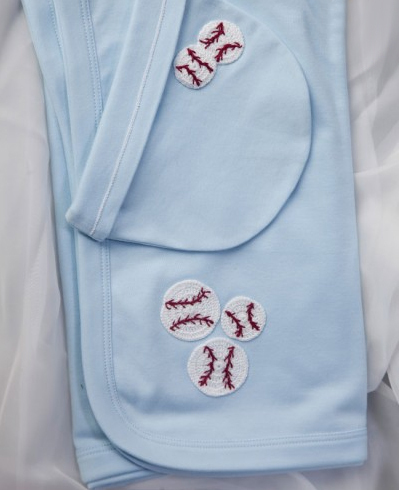 Or how about the micro-sized NY giants jerseys (I'm an avid fan) with matching crib booties for a tiny munchkin of a little boy? I can’t even take it. Lucky for me I recently became an aunt to the most beautiful baby boy (I love you Nash!) in the world and can spoil him rotten and buy everything and anything in sight to dress him in. One of my new favorite baby clothing lines to buy from is called Grandma Nes. They have the most special and intricately designed pieces crafted from the softest, most supple materials. Literally one touch and you instantly want to cuddle up and take a nap. There are tons of mix and match options which I love, along with baby accessories (YES! even babies need to accessorize) and stunning blankets. 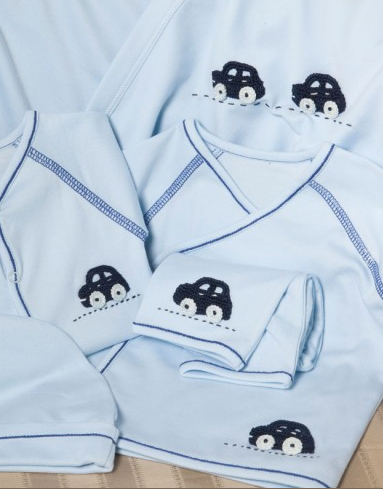 I wanted to know more about the line so I sat down with its founder, Michele Uzbay, for a brief look into the world of baby clothes. JJ: So I have to know, is Grandma Nes a real person? Or a fictional character? MU: Grandma Nes is a REAL person! Her name is Nesrin and she is my mother-in-law and the designer of all the lines in our Collection. When my first daughter was born she started calling her "Grandma Nes". Her designs and her name are the reasons our Company is called Grandma Nes. JJ: How did she come to start designing baby clothing? MU: When my daughter was born my mother-in-law lived in Turkey. She was so excited to have her first grandchild. One day a huge box came to my door. It was filled with the most wonderful knitwear. But not the typical home-made knitwear you might get from a relative. It was all kinds of beautiful sweaters and hats and blankets with special embroidery and designs. I was in shock. I asked Grandma Nes how long it took her to knit all of these things and she simply said "a few days". Nothing came from a pattern, it was all her designs and ideas. She is truly a Master Knitter and Designer. When Grandma Nes was visiting from Turkey for the birth of my second daughter, we decided to go to our local children's boutique and show them some of her work. They saw it and immediately said that their customers would love this and they would buy it! Grandma Nes went back to Turkey and knit two complete sets, one for boys and one for girls. The word of mouth spread and more and more orders from other high end stores and boutiques started coming in. That was the start of our Company. JJ: Where do you produce all of the clothing? MU: We used to produce all of our clothing in Turkey. It was all handmade by Turkish women in the most quaint villages. At one point we had almost 300 women working for us from the villages of Turkey. Grandma Nes was written up in the Turkish newspapers for how she had employed so many people and gave work to so many women. Then when we got our first really large order from Bloomingdale's we realized that this method of production was no longer going to be a reality for us. Mainly because the outfit sizes were too inconsistent because they were being made by many different people by hand. We recently moved our production to Peru, where we are now able to get the best and softest cotton available, PIMA cotton; all with our signature Grandma Nes designed hand-embroidery. JJ: Did you always know you wanted to start your own business? MU: No. Actually, the inspiration was Grandma Nes' designs and how well they have been received by our wonderful customers throughout the world. Everything grew so naturally from there. JJ: When you first started, how did you set out to distinguish your brand from the already very crowded children's clothing market? MU: I sincerely felt that with Grandma Nes' design style we had something that no one else had. It was simply the most beautiful hand made embroidery I had ever seen. No one else was doing this then and no one is doing this now. Over the years, Grandma Nes has designed so many different beautiful signature designs that I have never seen in any other brand. Her designs bring people back to that classic baby wear they had been looking for. Our grandmother-customers always tell us how much they enjoy our classic styles and designs. JJ: How has the collection evolved from when you first started to where it is now? MU: We started as a hand knit company. We only produced sweaters and knit blankets with hats. Over time we added cotton play-wear to our collections. We realized that along with the sweater gifts we could offer matching embroidery on cottons for every day use. We actually do more business now with our cotton clothing than the original knits because you get the same unique designs, but it's very easy to wash and wear... and with children that really makes a difference! We've also seen such success with our Boy Collection. 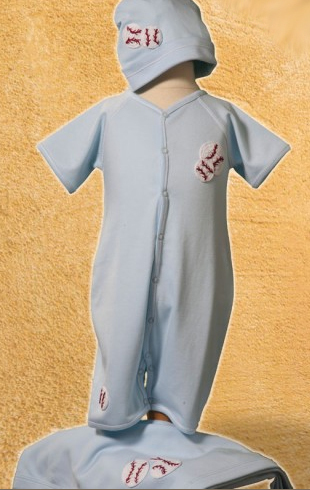 It is so hard to find ways to make boy clothing interesting and different- but we have found a way with our Baseball, Football, Car, Train & Bear Collections for Boys; they are so sporty, classy and handsome all at the same time. JJ: Have your own children played a role in inspiring pieces in the collection? MU: Everything Grandma Nes has ever designed has been inspired by her grandchildren. So much so that she names many of our collections after them. My children have even been models for our collections. JJ: What sort of materials do you use to get the clothing SO soft? It’s so delicious! MU: We exclusively use cotton and since we produce in Peru, we are able to get PIMA cotton, which is the softest cotton in the world. 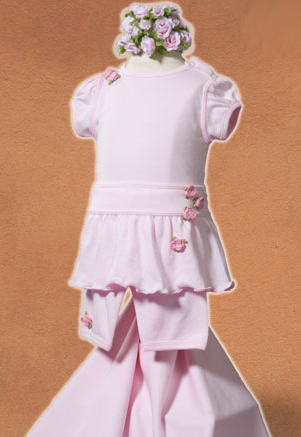 It is perfect for newborns and infants and makes a real difference in the quality of our clothing. You have to touch it to believe it. JJ: Do you have plans to develop your brand even further? What can we look forward to from Grandma Nes? MU: The most exciting development at this point is that we have changed how we sell to our wonderful customers all over the world- Grandma Nes is now going live with our new website www.grandmanes.com After 10 years of selling through retail stores we have decided that we can offer our famous Grandma Nes Collections directly to our customers. The response has been truly heartwarming. Adorable - will check out the site!